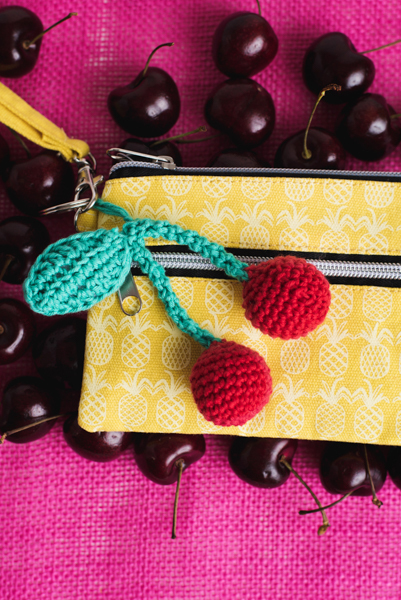 This set of two fruit-inspired keychains adds flair to any purse. 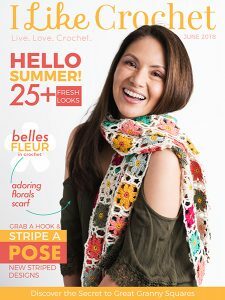 On trend and great for making for teens, these are a fun and fast way to create something cute. 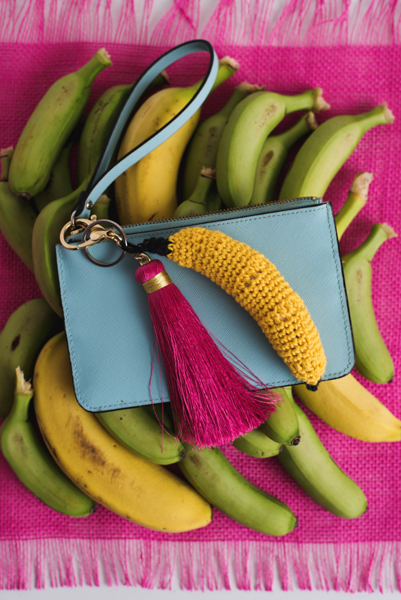 Size: ​Banana is 5” tall. 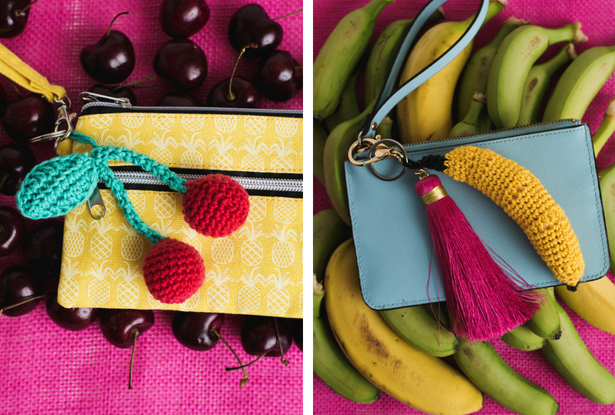 Cherries are 3.5” tall, the cherry leaf is 2” from tip to tip, & each cherry is approx. 1” around. Notions​: Tapestry needle, 2 keyrings, poly-fil, scissors. Using C3, create a magic ring. Rnds 5-8: Ch 1, sc in next 20 sts, sl to join. Rnd 11: Ch 1, *sc in next st, sk next st; rep from * 4 times more, sl to join. Break C3, leaving a 4” tail. Rnd 12: Using C4, ch 1, *sc in next st, sk next st; rep from * once, sc in next st. Do NOT sl to join. Cont to work in a spiral, work 27 sc. Break C4, leaving a 4” tail, and draw tail through. Rnd 1: Using C4, fsc 10. Turning to back of fsc sts, sc in the back ridge of 10 foundation ch, ch 1, sl to join into rnd. Rnd 2: Sl in first st, sc in next st, hdc in next st, dc in next 2 sts, hdc in next st, sc in next 2 sts, sl in next 3 sts, sc in next 2 sts, hdc in next st, dc in next 2 sts, hdc in next st, sc in next st, sl in next st. Break yarn, leaving a generous tail. Sew both leaves together with wrong sides facing, and stuff before closing. 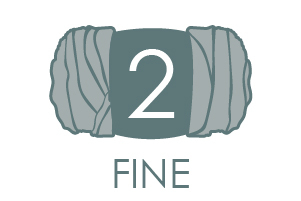 Weave in remaining ends. Sew both Cherry and Stem piece together at the tip of each stem, and sew them to the stuffed Leaf. 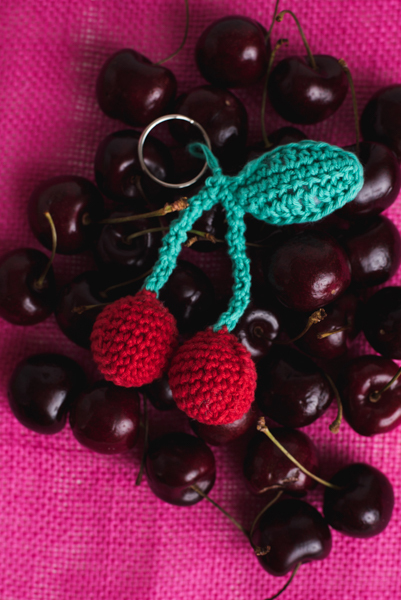 Sew a loop of C4 yarn to the top of the cherries and place on a key ring. Using C2, create a magic ring. Rnd 2: Ch 1, sc in next 4 sts, sl to join. Rnd 3: Ch 1, *sc in next st, 2 sc in next st; rep from * once more, sl to join. Break C2, leaving a 4” tail. Rnds 6-7: Ch 1, sc in next 12 sts, sl to join. Rnd 8: Ch 2, dc in next 2 sts, hdc in next 2 sts, sc in next st, sl in next 2 sts, sc in next st, hdc in next 2 sts, dc in next 2 sts, sl to join. Rnd 10: Ch 2, dc in next 2 sts, hdc in next 3 sts, sc in next 2 sts, sl in next 2 sts, sc in next 2 sts, hdc in next 3 sts, dc in next 2 sts, sl to join. Rnds 11-15: Ch 1, sc in next 16 sts, sl to join. Rnds 16-20: Rep Rnds 11-15. Rnds 21-25: Rep Rnds 11-15. Rnd 27: Rep Rnd 8. Rnd 28: Rep Rnd 6. Rnd 29: Ch 1, *sk next st, sc in next 2 sts; rep from * 3 more times, sl to join. Break C1, leaving a 4” tail. Rnd 30: Using C2, ch 1, *sk next st, sc in next st; rep from * 3 more times, sl to join. Break C2, leaving an 8” tail. 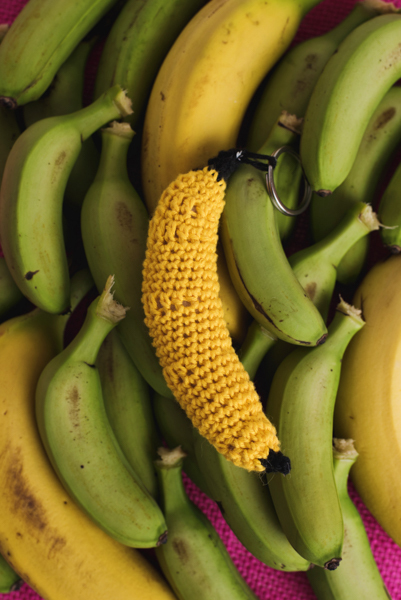 Using the 8” tail of C2 yarn, securely create a loop at the top of the Banana and place on a key ring.